PayrollPanda — How do I archive/remove an employee that has resigned or left the company? Help Center Home App How do I archive/remove an employee that has resigned or left the company? You can either archive an employee, which keeps their records, or remove an employee, which permanently deletes them. (i) An employee is archived immediately even if the 'Date of Removal' is in the future. (ii) You are only able to permanently delete an employee who has not yet been part of any payroll. Select the reason and the date of removal. You may also add an alternative (personal) email address for your records. Further, you can select "Prorate Salary" for any employee who leaves part-way through the month, so their salary is automatically adjusted. In order to exclude an employee from this month's payroll you have to select the last day of last month, i.e. to exclude an employee for September payroll the effective date should be August 31. Once an employee has been archived, he/she will still be able to enter the app and view their payslips. 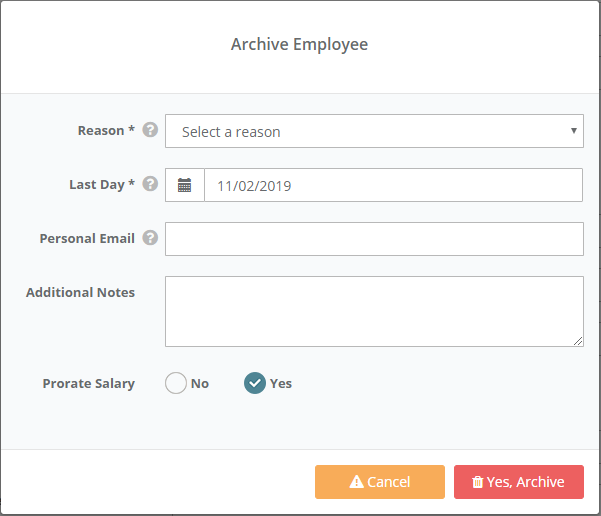 However, if you wish to remove all access for the employee, you can do so under Employees > Archived Employees > Select Employee and click Remove access. If you want to permanently delete an employee, you first need to archive that employee following the steps above. Click on Archived Employees and select the employee you want to permanently delete. Scroll to the bottom of the page and click 'Remove Permanently'. A pop-up asking for confirmation will appear; click 'Yes, Delete' to permanently delete the employee. Please remember that this is only possible if the employee was not previously part of any payroll.